DERRY CITY leapfrogged Bray Wanderers into sixth place in the Airtricity Premier Division table to ease relegation worries with just three games remaining in the 2015 season. 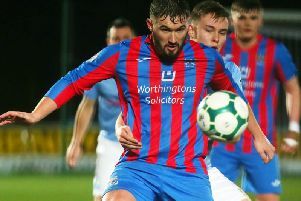 It was the Candy Stripes’ seventh point from three games since caretaker boss, Paul Hegarty took the reigns after games against Shamrock Rovers (1-0), Cork City (0-0) and Bray (3-1) as they move closer to safety. Derry flew out of the blocks and into a two goal lead after just 10 minutes as top goalscorer, Mark Timlin netted a fine strike on four minutes to take his season’s tally to 11 goals. It was his first goal since his double against Galway last August! And Dean Jarvis then headed Derry into a comfortable lead six minutes later with his second goal in three games. Bray hit back after the break when Graham Kelly took advantage of Ben McLaughlin’s loose pass and slotted past Doherty. And just as Bray seemed to be finding a way back into the game Patrick McEleney lit up the Brandywell with a sublime strike from 25 yards to restore Derry’s two goal advantage. Bray’s FAI Cup semi-final exertions appeared to be catching up with them as a rejuvenated Derry began brightly and Ciaran O’Connor probably should have done better after 50 seconds when he got onto the end of Stephen Dooley’s cross but his cushioned header was gathered cleanly by Peter Cherrie. One minute later Timlin was played through on goal by Patrick McEleney but his low strike was closed down by the retreating Niall Cooney. The Candystripes finally broke the deadlock on four minutes when Barry McNamee found Timlin on the edge of thepenalty area and he curled his left footed shot sweetly into the far corner of the net. There was no let-up from City and the Seagulls looked all at sea when from Dooley’s corner kick Jarvis nipped in at the front post and stooped to head past the helpless Cherrie - his second goal in three games. Bray were not to be disheartened and Gerard Doherty needed to be alert to turn Kelly’s shot from distance around the post on the half hour mark. However, O’Connor should have done better when he was put clean through on goal by Timlin but he delayed his shot and Cherrie made the save on 39 minutes. It was an unconvincing start to the second half form both teams but Bray took full advantage of a loose pass from Ben McLaughlin deep inside his own half and Graham Kelly ran through on goal before calmly slotting past Doherty. Just as Bray began to get a foothold on the game McEleney produced a moment of brilliance when he curled his right footed shot into the top corner of the net to restore the home side’s two goal advantage on 62 minutes. Bray almost pulled another goal back on 70 minutes when substitute David Scully found himself in behind the Derry defence but his low strike bounced back off the post before the ball was cleared. In the end Derry did enough to secure a vital victory which takes them into the top half of the table. Derry City: G. Doherty: B. McLaughlin, S., Sharkey, R. Cornwall, D. Jarvis; S. Dooley ( A. McEneff 63), B. McNamee, C. McCormack, M. Timlin; P. McEleney (R. Curtis 90), C. O’Connor (M. Quigley 59); Subs Not Used - S. Patton, P. McClean, C. Morrison, J. Daniels. Bray: P. Cherrie; H. Douglas, A. McNally, N. Cooney, M. Barker; A. Hanlon ( E. Onwubiko 78)J. Sullivan, R. McEvoy, D. Cassidy, G. Kelly (L. Fitzgerald,66); C. Lyons (D. Scully 66); Subs Not Used - S. Fogarty, A. Mitchell, A. Wixted, G. McDonagh. Referee - Paul Tuite (Dublin).